If you are looking for a motorhome, you have several options. Most people advice you to go to a dealer or to your local RV store, but sometimes eliminating the middle man can mean saving money. Since the internet has become an indispensable marketplace, looking online is a great idea, not only for comparing prices, but also for finding your dream motorhome. Here are some of the most important RV stores online. Many of them also have stores that you can visit, and most of them offer both new and used RVs for sale. Some of them allow you to list your RV, so if you want to get rid of the old one and get a new one, they are surely very convenient! This store sells RVs of all kinds. You can easily narrow down your search by being able to look for the RV according to category, year of making, model, location and more. They have for sale travel trailers, pop up campers, cargo trailers, class A, class B and class C motorhomes, fifth wheels, truck campers and more. They offer both new and used RVs. They always have a sale going on, so if you are looking for a good deal, visit their website regularly. They have also inventory clearance sales that can really get you a good bargain. If you are only interested in a local RV, call them and they will find you one. They also sell all kinds of RVs, from fifth wheels to park models. Their best offers are featured on their website, so you can easily find what is really worth to buy. Through their website you can even find RV campgrounds, and buy RV parts and accessories. When you are looking for an RV here you can make a search according to mileage rate, this way avoiding those RVs that have been used a lot. If you want to make an ad and sell your vehicle, you can do so here. Their blog and their articles contain several tips and useful information about your mobile home that you perhaps didn’t know about before. They are the RV consignment leaders since 1972. They have pictures, floor plans, and description for their products. If you need an RV delivered to your location, they will do it for you, this way you can also buy an RV that is not so close to your area. They sell new RVs, but also pre owned rare models in good conditions. You can visit their superstore for motorhome parts and accessories, and take advantage of their friendly service for extra information and advice. From toy haulers to class A diesel and gas motorhomes, you can find everything at this store. They have mobile homes for sale from such big names as Winnebago, Fleetwood, Thor MotorCoach, Forest River, Skyline and more. They also have some specials that are worth to look at and consider. They have RV shows going on that are definitely worth to take a look at. The prices of these RVs are drastically reduced, and they also have a special financing set up for the show. For internet specials call their hotline, and find the best offers for your budget. Ebay remains until today one of the most popular markets online for everything including motorhomes. You can find really good bargains on eBay, and when it comes to pre owned motorhomes, make sure you check out the offers they have. Most of the ads are posted by private sellers, which has many benefits compared to dealers. Ebay is also a place where if you are lucky, you can find very rare and old models in decent conditions. If you haven’t found anything interesting, you can use it to compare prices. You have to look at this website if you are planning to make a trip. Besides having RVs of all kinds, they have lots of camping accessories, products of hardware and maintenance, plumbing, coves and storage accessories, and many other items that you will need for your trip besides the RV itself. They offer both new and used RVs for sale. Check their website regularly for sales, clearing items, special offers and more. If you are a Good Sam member, they offer free shipping on anything that you buy from them. When you order online, you will also get instant rebates. Motor homes are basically manufactured to meet the needs of campers for spending their vacation, rv trips or live for small period of time. Motor homes are generally built on vehicles like vans and motorcoach and cater for small families. You find numerous advertisements for rv motor home sales and motor home park campground sales in local media or online websites. You can also sell your used rv motor home through media advertisements-yourself-or through rv motor home dealer. My favorite online place for rv motor home sales is here! You can also search for rv motor home sales by owner. Being a seller you should ensure that you gain maximum profit out of your used rv camper motor home sales or rv camper motor home park sales. Following will provide you the necessary guidance to gain maximum from your used rv motor home. I have a friend who is rv motor home camp dealer and helped me in selling my used motor home at greater cost than I expected. Rv motor homes, rv motor home parks or camp grounds are undoubtedly expensive machines. Despite the factor of cost, I am sure you - a genuine camper- will feel it worth after enjoying the facilities these Motor homes provides you. This cost factor makes it some what difficult to get instant market for motor home sales. You have to search for good customer. It is better to sell your used rv motor home through a camper dealer who sells rv motor home lots. Before putting an rv motor home for sale or a rv motor park motor home for sale you must pay attention to the following to ensure that you make larger profit out of your used rvs. You must assure complete paper work of the rv when acquiring rv camper home from any type of motor home sales. Maintaining service documents, repair records and owner manual help you in rv motor home sales. Never disclose purchase value of your motor home or motor home camping ground to the prospective buyer unless you feel that disclosing the value of rv will your interest-keeping in view the presenting value of the rv- when you offer your rv for motor home sales. You must inspect your rv before offering for motor home sales-either through rv camper dealer or yourself. Carry out material improvement to rv motor home or motor home camper park which will enhance value of your used motor home. It is advisable to sought assistance of expert used rv motor home dealers-who have the experience to sell the rv motor home in lots. 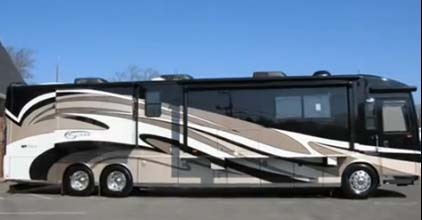 Motor home sales through dealers may bring you more money for your used rv. Use of digital camera to photograph your rv and advertise in media and online selling are good forms of rv motor home sales. If you want to sell rv motor home camper ground or rv motor home park make sure that title formalities are complete and camper ground or park is neat and clean before putting it for motor home sales. Usually, buyers check outlook of the used rv-like body leaks, roof, lighting equipments, furnishings, flooring-of the motor home for sales. Ensure maintenance of accessories like air-conditioning, radiators, chassis, heating units before putting for sales. Always try to conceal the drawbacks of the RV motor home you want to sale through motor home sales. Always highlight positive features of your RV.